Egypt on Sunday opened the country's first electric vehicle charging unit, as countries around the world incrasingly move toward a battery-powered car market. 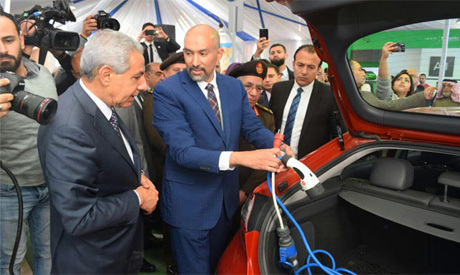 Egyptian Minister of Trade and Industry Tarek Kabil oversaw the opening of the new unit, installed at a state-owned Wataniya gas station on the Cairo-Suez highway and owned by Revolta Egypt, a developer of electric charging infrastructure and other electric vehicle-related projects. The minister said the opening of the new unit is the first step towards building Egypt's vehicle infrastructure. Kabil said his ministry aims to back adopting electric vehicle technology, saying it is environmentally friendly and cost-effective in terms of maintenance. Revolta said the project's first phase consist of the installation of 65 charging units across seven Egyptian governorates. Egypt aims to boost its use of renewable energy to 22 percent by 2020 as part of efforts to achieve sustainable development. The number of electric cars on the roads around the world rose to 2 million in 2016, according to the International Energy Agency. China, the US and Europe are the world's three main markets, accounting for over 90 percent of all electric vehicle (EV) sales around the world. China, the world's largest market in 2016, alone made up more than 40 percent of global EV sales. Britain said last year it would ban the sale of new petrol and diesel cars starting in the year 2040 in an attempt to reduce air pollution. With the electric car market concentrated in a limited number of countries, a November 2017 study by global management consultancy firm Boston Consulting Group expected a slow rise of electric vehicles through 2030. The study said that pure electric vehicles will not gain a serious foothold in most global markets until after 2025 and will likely make up only 14 percent of total global vehicle production by 2030.